Crimson Skies - FASA Games, Inc.
One of my favorite FASA universes is without a doubt Crimson Skies. 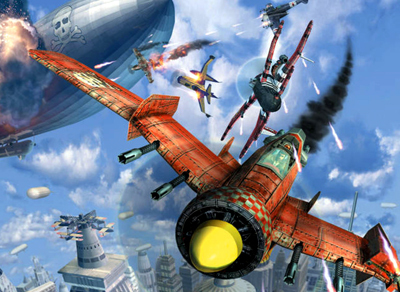 Alternate 1930s with retro-futuristic planes, art deco atmosphere, zeppelin battles and more importantly... sky pirates! What's not to love? So, I was wondering if FASA Games had plans to do something with this IP? - Digital re-release of the books and novels on DTRPG, including the ones never released in English? However I believe Microsoft used to own part of the rights to this universe... is it still the case? I'm fairly certain the rights for that property are elsewhere. I am not 100% certain on the rights, but I can guarantee that if we had the rights to them we'd be doing something with it. I am guessing it is tangled up in licensing hell but I am also not a legal guy. A wiki search indicates that it is currently owned by 'Smith & Tinker' after passing through Wizkids. It looks like the IP went the way of Shadowrun and then got spun out. Supposedly they are planning to release a new video game soon...so at least you have that to look forward to! Tanthalas wrote: A wiki search indicates that it is currently owned by 'Smith & Tinker' after passing through Wizkids. It looks like the IP went the way of Shadowrun and then got spun out. Supposedly they are planning to release a new video game soon...so at least you have that to look forward to! Smith & Tinker was Jordan Weisman's previous company, it closed in 2012 and Jordan subsequently founded Harebrained Schemes (makers of the Shadowrun Returns video game). As far as I understand they had a licensing agreement with Microsoft to do video games based on Battletech/Mechwarrior, Crimson Skies and Shadowrun, but they never owned these properties, and their licence was only about the video game side, not the pen and paper side. Well if someone would ever stop Disney from lobbying, stuff might fall into public domain someday. I wouldn't count on that though. Publish something online and see what company sends a cease and desist.